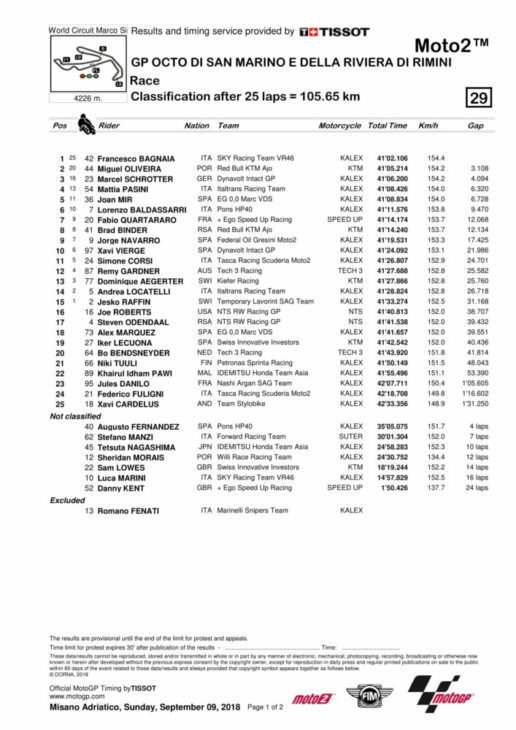 Pecco Bagnaia produced another impeccable race at home at Misano – leading from the first corner to the last, and extending his advantage throughout. The SKY VR46 Kalex rider also stretched his championship lead over second-placed Miguel Oliveira (Red Bull KTM), who finished a fighting second. The battle was with podium first-timer Marcel Schrotter (Dynavolt Kalex), who had shadowed him for much of the race, and made a final attempt to get ahead on the final lap … only to run wide, almost taking Oliveira with him. 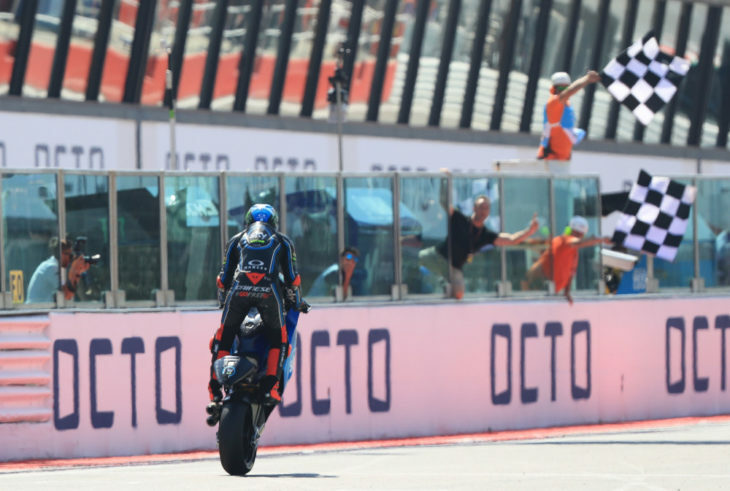 Veteran Mattia Pasini (Italtrans Kalex) was fourth, regaining the place from fast rookie Joan Mir (EG-VDS Kalex) when the Spaniard was ordered to drop back one place for exceeding track limits once too often. 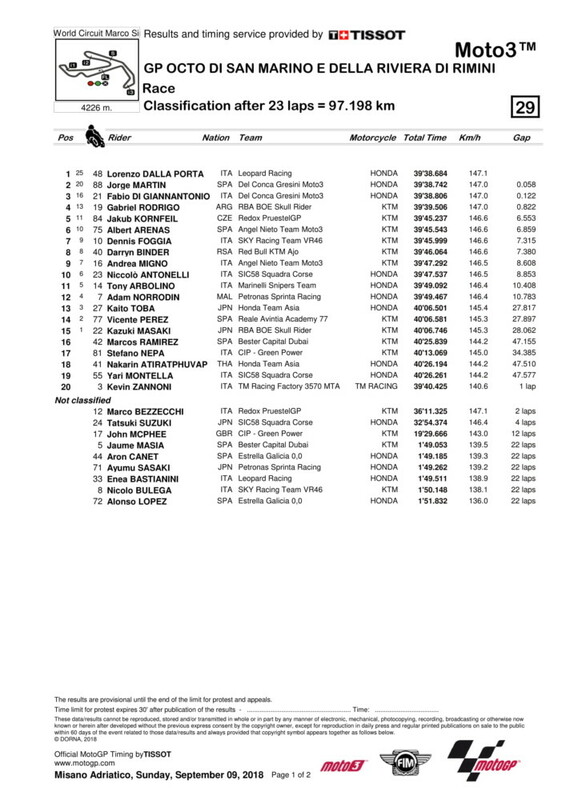 Lorenzo Baldassarri (Pons HP40 Kalex) came through to take sixth, at the end comfortably clear of Fabio Quartararo (Speed Up) and Brad Binder (Red Bull KTM). Alex Marquez (ED-VDS Kalex) had a third non-finish in a row after he was taken down on the first lap by fellow-Spaniard Augusto Fernandez. This dropped him from third overall, with Binder taking over, 95 points adrift of the leader, and just three ahead of Baldassarri, with Mir a close sixth. Returned injury victim Jorge Martin (Del Conca Honda) regained the championship lead, taking a photo-finish second place in a dramatic, crash-hit Moto3 race, first of the day. Martin was 0.058 of a second behind first-time winner Lorenzo Dalla Porta (Leopard Honda); his Del Conca Honda team-mate Fabio di Giannantonio was a similar distance behind in third; with Gabriel Rodrigo (RBA KTM) just over half a second adrift over the line. They were the survivors of a five-bike crash on only the second lap; with Martin missing involvement by micro-seconds. His second big fright came two laps from the end, when long-time leader Marco Bezzecchi (Redox KTM) crashed right in front of him. Martin collided with his rivals stricken bike, but stayed on board. Marti, who has won five races this year, now leads the championship by eight points. 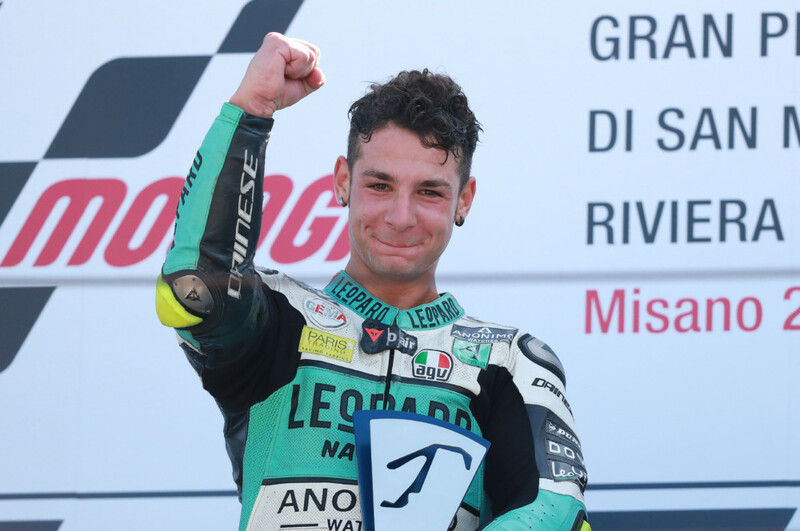 He arrived at Misano 12 points adrift of Italy’s Bezzecchi, who has won two. The Spaniard missed one round after breaking his wrist in practice at Brno, but was back to finish second a week later in Austria. The early crash was triggered when Spaniard Jaume Massia high-sided near the front of the leading pack. He took down Enea Bastianini, Nicolo Bulega, Aron Canet and Ayumu Sasaki, who was undergoing investigation for a possible fracture directly after the race.